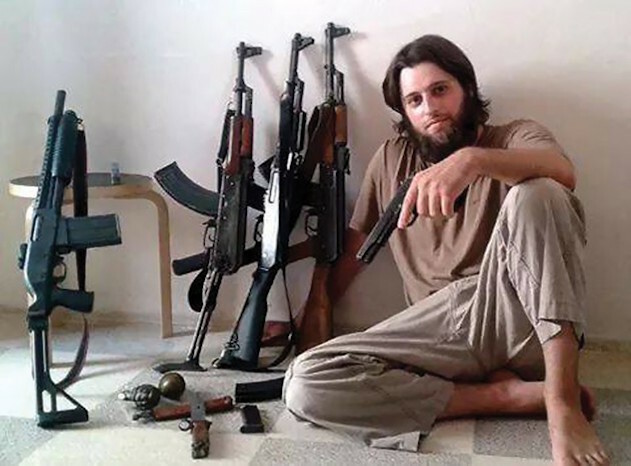 Texas born and raised, John Georgelas: in Syria and in charge of recruiting Americans for the Islamic State. John successfully wrote for the Islamic State's recruitment magazine, and now he is Chief of "overseas attacks". John Georgelas gave himself a Muslim name, Yahya Abu Hassan. Yahya taught himself Arabic and studied the Quran. During the following ten years, Yahya became fluent in Arabic, knowledgeable in the Quran and Hadith, and became radicalized. He declared himself a jihadist and promoted jihadi ideology on the Internet. In 2006, he was arrested for 'Supporting a Pro-Jihad Website' and served 34 months in prison. In April 2016, Yahya published an article in Dabiq targeting Western Muslims. His title, “Kill the Imams of Kufr [unbelievers] in the West” included photos of cross hairs over photos of well-known Western Muslims. The images also included a blindfolded “apostate” with an executioner’s blade entering his neck. Yahya’s article told stories of what happens when Muslims do not join in jihad and he emphasized that by not joining jihad, western Muslims were Kufr and apostates and deserved having their hands and feet cut off. Yahya promotes jihadist ideology, using Quran and Hadith as sources and support for jihad and terror attacks, but being an American, he also taps into the American Muslim mindset, targeting their weaknesses and vulnerabilities. He knows how to successfully recruit the American Muslim, and Western Muslims in general. Yahya, now Abu al-Hassan al-Muhajir, has a new name and a new job. A new job that includes “directing overseas attacks”. Which includes attacks in America.